Women of all ages can enjoy wearing fun faux fur items that not only look stylish but will keep you warm and cozy as well. Fake fur has come a long way and many items look identical to the real thing. You can easily and affordably wear fur in an animal-friendly way with the variety of options available both online and in stores. Keep in mind that retail stores mainly carry faux fur items in the winter season. For those who want to shop year-round, there are many sites to check out that carry a great selection of fake fur items. Faux Fur Masha Jacket: This edgy jacket is priced around $1500 and comes in sizes 36 to 44. Every-Wear Vest: This vest can be worn for dressy or casual occasions. It comes in sizes extra small to 3X and is priced around $150. Fur looks available include coyote, lynx, sable, red fox, leopard and black mink. This vest can be machine-washed in cold water. Blonde Mink Hooded Coat: This handcrafted coat is priced around $700 and is part of the Couture Collection. It measures 48 inches in length and comes in sizes extra small to 3X. This coat is dry clean only. Ted Baker London Stripe Infinity Scarf: Sold at Nordstrom, this infinity scarf is one loop with an open for secure closure. It is priced under $200 and comes in mid-purple and pale pink. This scarf can be hand-washed in cold water. Cossack Fur Cap: Sold at the Village Hat Shop, this hat is fashionable and will keep you warm on cold days. It comes in one size fits most and is priced around $40. Russian Sable Faux Fur Trimmed Shawl: This brown shawl is done with faux fur trim and is available in one size fits all. It is priced around $150. Faux Fur Trim Gloves: These gloves are cute and stylish and are priced around $48. They come in your choice of black or gray and feature screen compatible gloves accented with luxurious faux fur. Fur Trim Denim Jacket: This denim jacket has a faux fur collar that is removeable. It comes in sizes extra-small to extra-large. It is priced around $130. Hollister Faux Fur Sweatshirt: This unique sweatshirt features a fake fur collar. It is priced around $40 and comes in sizes small, medium and large. Faux fur is fun to wear and can add an entirely new look to your existing clothing collection. 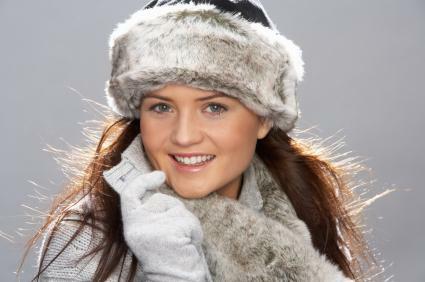 From simple accessories to elaborate coats and vests, wearing fashions accented or done in fake fur is a great way to make a statement and show off your personal style.